With the help of our experienced professionals, we are able to manufacture and supply a vast assortment of Plastic Hangers. All our products are manufactured using optimum-grade plastic as per industry set guidelines. 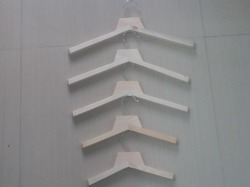 Printed Top Hangers with Metal Hook Etc. 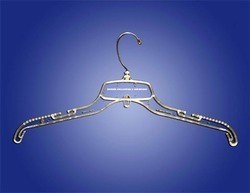 Owing to years of industry experience and knowledge, we have been able to offer a supreme quality Garments Hangers. 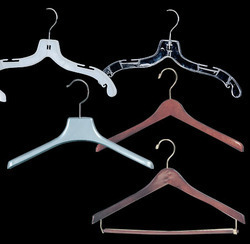 The offered hangers are designed by our experts using best grade material and modish technology. 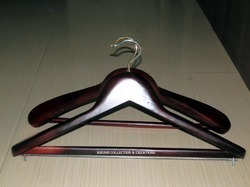 Additionally, offered hangers are made available in several sizes & shapes. 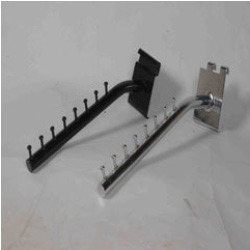 Furthermore, these hangers are highly demanded by our customers for their easy usage. 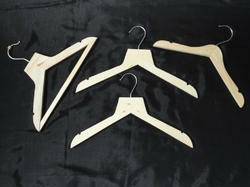 We provide a wide range of Shoes Hangers. 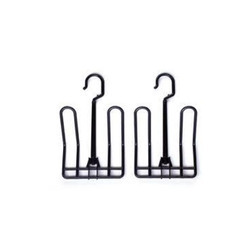 Our premium quality shoe hangers can be put over-the-door and make use of wasted space on the door. 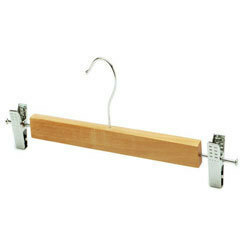 These shoes hangers are made of high quality materials that ensures durability and sturdy structure. These can be fit behind any standard door. 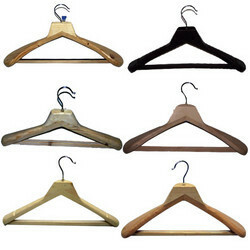 We offer a wide range of fabric coated hangers to our clients. 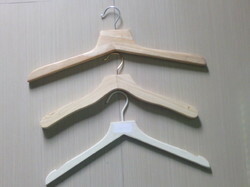 Hangers offered by us, are of a great help for our clients in hanging their different kind of cloths in wardrobe. 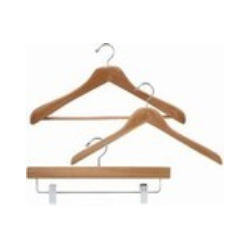 We offer designer hangers in an array of appealing designs. 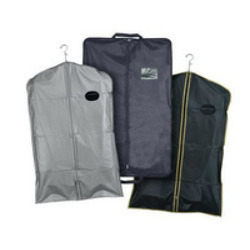 We are leading manufacturer of wooden hanger, plastics hanger & metal hanger or more garment product like pvc garment bags, pouch and non woven bags etc. Required more details please contact us. 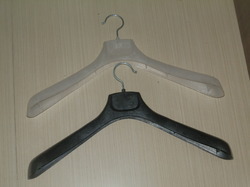 a) Plastic, Metal, Wooden Hanger . For Any Further Enquiry Contact As. Owing to years of industry experience and information, we have possessed the capacity to offer an incomparable quality Garments Hangers for Home. The offered hooks are composed by our masters utilizing best grade material and modish innovation. Furthermore, offered clothes rods are made accessible in a few sizes & shapes. Besides, these hooks are profoundly requested by our clients for their simple utilization. 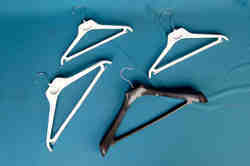 For years clear plastic hangers have been a favorite of clothing retailers and department stores. The unmatched quality and price of these plastic hangers are sure to be a favorite of yours as well. We caters for every garment requiring a hanger as we work in partnership with retailers to deliver the most suitable display option for their garment. Our designs ensure that the garment hanger will maximize garment display and ease of handling while optimizing manufacturing efficiencies and cost competitiveness. 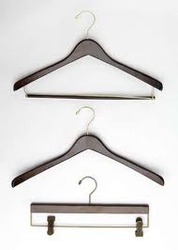 If the ideal hanger for your garment does not exist, our in-house design specialists will develop it for you. 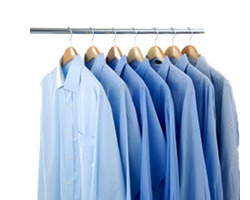 With our in-depth knowledge and experience, we are engaged in offering a finest quality Garment Hangers & Clothing Peg. 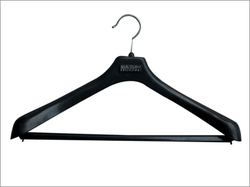 Offered hangers are well known in the market due to its durability and high density. 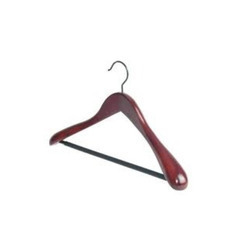 These hangers are designed by our experts employing leading technology. 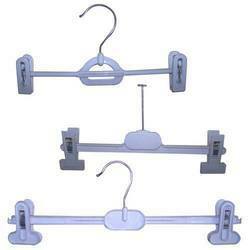 Our customers can avail these hangers in various specifications as per with their needs. Khushi collection and creations is a reputed name in manufacturing & exporting of plastic granules Plastic hanger, wooden hanger, metal hanger, Wooden Designer Hanger, Metal arm hanger, Satin Padded Hanger, K-Resin Hanger etc. We have gained immense expertise and experience under his able guidance and futuristic vision. With an uncompromising effort & dedication towards quality and perfection we have elevated our standards of excellence. 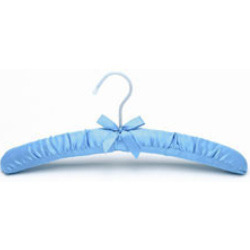 We hold expertise in manufacturing and supplying a superior quality range of satin padded hangers. 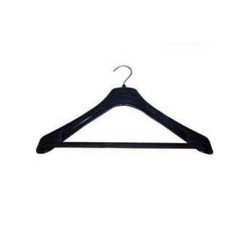 manufactured using excellent quality material, these hangers are used in various sectors such as apparel, fashion, retail as well as households. These products are highly appreciated for their high strength, light weight and optimum durability. Furthermore, we offer our product-line in various sizes, designs and shapes to suit the variegated requirements of clients. Innovation is our forte and we strive to design and develop a qualitative array of Metal Arm Hangers. Our experienced professionals use hi-impact metal in the manufacturing process. These high enduring hangers cater to the vast requirements of apparel, fashion, retail and other commercial and household applications. Moreover, clients can avail our range in various styles and sizes at nominal prices. Khushii enterprises...mumbai Manufacturer & Exporter of a wide range of products which include Garment Hangers such as Garment Hangers & Clothing Peg, Coat Suit Stands, Hangers & Cloth Pegs, Shoe Hangers, Wooden Hangers, Suit Wooden Hangers,Metal hangers. plastic hangers and many more items. 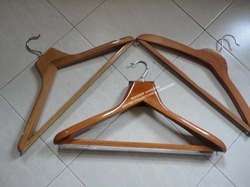 All above hangers with Metal hook if req. 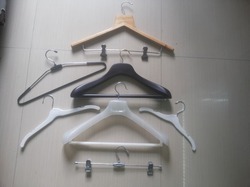 Plastic, Metal, Wooden Hangers . Exporter and manufacturer of ALL types of hangers like coat hangers , suit hangers, childrens hangers, designer hangers , custom made hangers , in wooden , metal, and plastic. 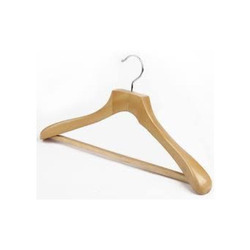 Looking for HANGERS- GARMENTS ?